Dean Jonathan Koppell and the ASU College of Public Service & Community Solutions invite you to a Community Leadership Conversation at the iconic Concho Room in downtown Phoenix's historic Westward Ho Hotel. If you haven’t seen the new home of ASU's Center for Applied Behavioral Health Policy at Arizona State University, here's your chance. The lower level of the treasured hotel has been transformed into “The Collaboratory on Central at Westward Ho" to educate students interested in applied behavorial health studies and serve the needs of local residents. Attendees will be updated on recent College initiatives and accomplishments. Attendees will be asked to provide feedback on how the College can strengthen its focus on learning, listening, and networking. A brief presentation from ASU's popular “Public Service Impact Talk” series will be given. Bikes Fight Poverty / City Lights Movie Night "Home"
This event will be a film screening of DreamWorks Entertainments film “Home.” In this film there are several themes of home and sustainability that will be communicated to the audience through a pre-film discussion with Arizona State University thought leaders. Participants at this event can also pick up an activity sheet to further explore the film’s sustainability themes at home on their own. 1mission.org is a valley nonprofit that brings cyclists together to bike 207 miles to Mexico to build homes in areas of need. This partner is a natural fit for our theme (Re)imagine Our Home. 1mission.org will be registering cyclists at this event and encouraging families to attend the film screening. Join 1MISSION's charity bike ride from Phoenix, AZ to Puerto Peñasco, Mexico. We promise it will be one of the best weekends you have ever spent on a bike. You have the opportunity to choose from four different distances: 30Miles, 62Miles, 100Miles, or join the 207Miles team! Together we can change the world! Our walking tour will highlight local and independently owned coffee shops and give guests a taste of the places, spaces, and faces that make our city unique. The tour route highlights public artworks and historical buildings throughout downtown Phoenix and the Roosevelt Row Arts District. In addition, the tour will stop at a few of the best local java spots in the neighborhood. This two hour Saturday morning stroll will leave guests feeling buzzed and excited to discover more about coffee and Downtown Phoenix. Discounts available to Arizona residents! Sign up at phxtours.com. Upon registration, you will receive the start location and other pertinent information. Be sure to get your tickets to this great tour by clicking the link! Downtown artist and mom Chris Pruitt invites you to this free, family-friendly event where children, young, and not so young, are encouraged to make art and make forts. Families are encouraged to bring their best fort-making materials, supplies, and skills. Now the entire Pruitt family wants to build forts and draw with anyone who wants to join them on February 11. Design RePublic is delighted to celebrate Roosevelt Row, one of our favorite places in Phoenix! Working from our design toolbox on wheels, The Mobile _____ Studio, we will host a workshop and share our design and stencil-making processes. You can make your own stencil and use onsite or take it home. Your new stencils can be used outdoors or inside to celebrate and beautify landscapes all over the Valley. * Near The Mobile Studio, we will have installed a set of mandala designs made to celebrate exploration. Please feel free to photograph and share on social media the stencils we have onsite and the ones you make for use at home . *Please use the stencils only on private property where you have permission to leave a mark. They look especially great on driveways, garage floors, and concrete surfaces. Bring a dish or something for the grill and share a delish lunch with community members. This event coincides with street art activations and a fort building session. A great way to have lunch, make something and make new friends downtown. Join us! Join Phoenix Rising Tour Company for a guided Art & Mural Bicycle Tour of downtown Phoenix! You'll visit public spaces, public art and murals that dot our urban landscape. Sign up at phxtours.com. Once you register, you'll receive instructions with the starting location and other pertinent information. Join us for a fabulous day! Parking is available at the parking garage located at 1st Avenue and Holly. You are also welcome to park in any available location within our neighborhood. Trolleys will be continually running throughout the day and you are welcome to hop on and off at your convenience. For news and updates on the tour, please visit our Facebook page. Join us for a community dialogue in which we define 10 key terms in urbanism as it relates to Phoenix. Meet with Katherine Coles with the City of Phoenix and Lindsay Kinkade with Design RePublic to discuss the latest news and information about implementing the Walkable Urban Code and the vision for a walkable and connected Phoenix. By the end of the conversation, we'll have covered actionable steps that developers and citizens can take to keep Phoenix moving. Join us! Meet Me Downtown Phoenix (MMDT) brings people of all ages to downtown Phoenix for a weekly social walk/run, engaging individuals and businesses in a vibrant event that showcases downtown Phoenix as a prime location for healthy activities. 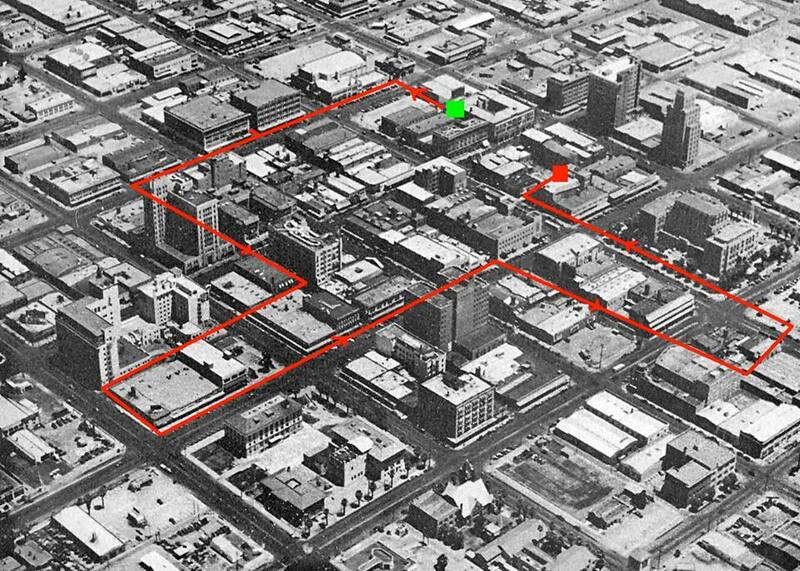 Special for this year's Phoenix Urban Design Week, MMDT participants can journey through downtown alleys and plazas, some that date as far back as 1885... to today. Jeff Sherman, Phoenix native and downtown advocate, has researched downtown Phoenix history from this particular vantage point: alleys, dark and not so dark! Check-in at 5:15 pm to 6:30 pm. If you park in the garage have your parking validated at any CityScape business. Don’t wait in line…register anytime or check-in (after 3 pm) online from home or your smartphone. You register only once, then check-in is so easy. Already checked in? Good move! Walk or run anytime. We provide a route guide. Route is 3.3 miles, plus a 1.8-mile extension for the runner who wants more distance. Want to join a group? Just ask. 7 pm… Closing ceremony, awards and a weekly free raffle…gift certificates for local restaurants/businesses and Sole Sports Running. We track attendance…you earn free incentive awards…click here. Awards presented at closing ceremony. Area restaurants offer discounts on Monday evenings with your MMDTPHX hand stamp. Click here for discount details. SAFETY FIRST! Please obey all traffic signals…this is not a race. It’s a healthy social occasion. The February Get Your PHX at the Dressing Room as been a long time coming. monOrchid owner, Wayne Rainey, has been dreaming of turning this structure in to a micro restaurant for years. After lots of hard work and a few set-backs, he's finally done it. The Dressing Room is designed to serve "Global Street Food” from a Micro Restaurant that also has a respectable craft cocktail list, wine & beer. The will be a full service, fast causal restaurant. Of course, it would not be what it is without the people behind the restaurant itself. You will have a chance to meet Kyu Otsunomiya and Troy Watkins, the brains behind the venture. The two have been friends for 20 years and have worked some of the top restaurants and hotels in the world. They will tell us how they used Kickstarter to launch the Dressing room, and their vision for the future. They have also activated the back alley to include a 40 seat patio, designed around a full grown Native Mesquite Tree and a converted construction dumpster, which had been turned into a full fledged prep kitchen. So, there you go: adaptive reuse. They will be open Mon - Thurs:11am to 11pm; Fri - Sat: 11am - Midnight & Sun - 11am to 10pm. They will also have a happy hour every day (Half-off all specialty drinks, beer & wine from 11am to 6pm). So, there you go: day drinking on Sundays! The dressing room has a storied history, in case you don't know. Decades ago there was a bar where the apartment building is now next door. You may have known that building at Greenhaus boutique. That bar had an original piece of art on the wall by Ettore DeGrazia, which was destroyed when the developer put up the apartments. (tisk, tisk). Anyway, when that building was a bar, local drag artists would put on shows for adoring crowds. Because the bar was so small, the performers had to go to the little structure across the dark alley to get ready to go on, then scoot back in time for their next performance. It was their dressing room. The current owners have kept the name in honor of the performers. At a time when downtown Phoenix was a little dangerous and in an era when performing in drag could put you in real danger (even more than today), these artists really put themselves out there for their craft. Join Marshall Shore, the unofficial Arizona Hip Historian, for a bus tour of historic graveyards, ruins, and ghostly haunts in downtown Phoenix. The tour commences at the Clarendon, a boutique hotel with a wildly checkered past. Once the scene of the infamous Don Bolles murder, the hotel is home to various ghosts, including some recent and some longtime residents. Cost: $30. Tickets are non-refundable. Parking available at the Clarendon Hotel.